Close to Mile End and looking towards Canary Wharf where you can make out the tall buildings on the horizon. The building with the triangle on top was the tallest building in London until quite recently when the building frenzy in the City of London began, and we now have the Shard taking the leading role as the tallest building. The lovely park like gardens has an art gallery on one side and new apartment buildings on the other. Regeneration of the area began with the Olympics and is still taking place. 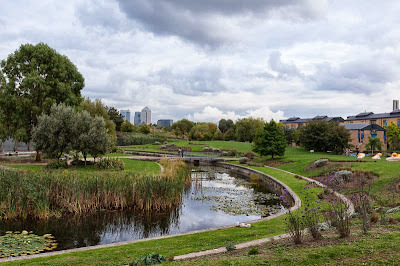 The Olympic Park is just up the road from this spot. A nice view with changing horizons but it still looks rural. We forget how many green areas there are in London. This is such a pretty view. That must be Canary Wharf in the distance. I remember visiting there about 10 years ago and thinking how modern the area was. How wonderful to see such grand open spaces like this in London. Nice shot. Blimey, Guv'nor! That's changed a bit since I was at college dahn the Mile End Road! For Centrepoint - we went in one afternoon, up the outside stairway to the reception desk and made reservations for the next day and then went back and up to the bar. It was a very controlled entrance for sure but it is open to the public as long as you are dressed appropriately i.e. no runners, no jeans, etc. The view was worth the hassle. Isn't this just gorgeous? I love how lush and green it is yet well kept too.